These were the best muffins I've ever baked, according to my Grandma and her husband. Full of chopped fresh apple, cranberries & pecans. Preheat oven to 375 degrees F. Line 6 Texas-sized muffin cups with paper liners or line a standard 12 cup muffin pan. In a medium-sized bowl, sift together flour, baking powder, salt, and cinnamon. Stir in granulated sugar. In a large bowl, whisk together butter, milk, egg, and orange zest, until well combined. Add the flour mixture to the liquid ingredients, and stir until just combined. Gently stir in apples and cranberries. Spoon batter into prepared muffin cups. Divide the pecans evenly between each muffin cup, and sprinkle on top, followed by the turbinado sugar. Cool muffins in pan for a few minutes, then transfer to a wire rack, to cool completely. 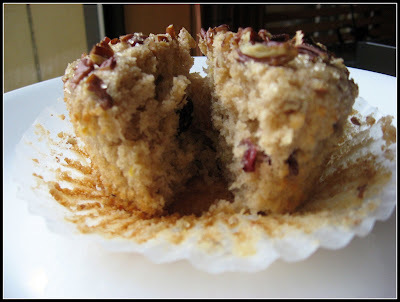 11 comments on "Apple Cinnamon Cranberry Muffins"
Yum! 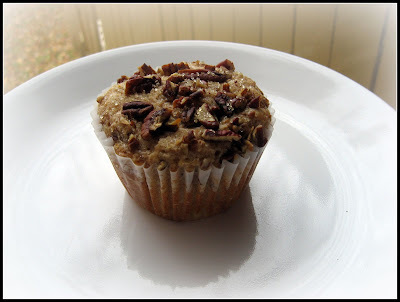 These sound like a perfect muffin for a fall morning! That is one pretty muffin. I can never get mine to look that nice. I love cranberry anything. These look great! These look so good and I have all the ingredients. Might try with fresh cranberries, think it will work? Julie- I'm not sweet. I'm mean. I'm sorry you don't like cranberries or orange. We all have different tastes. Anj- Thanks! These muffins were quite handsome. They look yummy! Soft, tender and crumbly! Your grandma must have been overjoyed that you baked for her. Grannies are so cute! Those look delicious! I need to start eating more breakfast. That is a good looking muffin! I'm just trying to get back into your good graces again, but those muffins sound excellent...AND you actually called them what they were...Oh, I just can't help myself, can I? Mmmm, I haven't made homemade muffins for a long time. These look really good! Kelly- Breakfast is the most important meal of the day. Sue- Thanks. I will accept your compliment. Watch yourself in the future. Jenny- Homemade is the way to go.